This page will explain how to create Facilities/Locations in TRAKnet 3.0, a necessary step prior to initial use. What are Facilities and Locations? The Facilities/Locations section of the Properties tab will be where all facilities and locations your office visits will be entered. These will include your main office, any satellite offices, any nursing homes or assistance living facilities, and the patient's home. Any location that will be used in billing must be entered here. To add a location or facility, click on the Facilities/Locations category under Properties and click the green Add button. This will open the Facilities/Location editor window. Name — A required field, this is the legal name of that location. This name will appear when billing for this location. Short Name — A required field, this is an abbreviated name of the location. This name will appear on the login and main screens of TRAKnet, but will not be sent with claims. Street Address 1, Street Address 2 — Address information for the location or facility. City, State, Zip Code — Address information for the location or facility. Please be sure to use the full 9-digit zip code for billing purposes. County — The county in which that location resides. Phone, Phone 2, Phone 3, Phone 4 — Contact information for this location or facility will be entered here. There are four separate lines for up to four numbers. Fax, Fax 2 — Fax numbers can be entered here. There are two separate lines for up to two fax numbers. e-Mail — A primary email address for the location. Website — The location's website. 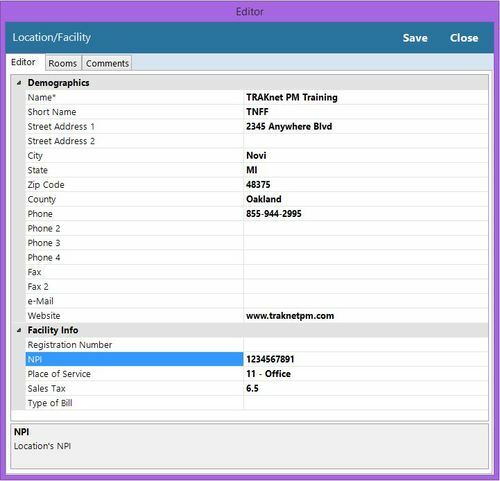 This portion of the editor screen contains more billing specific information such as location NPI, Place of Service code, Sales Tax, and Type of Bill identifier. Registration Number — The location's registration number. Note: This is a retired field. NPI — The location's NPI number. Place of Service — The locations POS number, for billing purposes. Sales Tax — Sales tax for this location. Over the counter products sold from this location will automatically calculate sales tax. Type of Bill — Location's type of bill identifier needed for institutional claims/UB04. The comments tab at the top of the Editor window will allow for any additional, internal comments to be added to this location. To save a location, click “Save” in the upper right-hand corner of the editor screen. The location will now be visible under the Facilities/Locations category. To search for a location, type in the name in the search window. To modify a location, click on the location in the list of locations and click Modify. To remove a location, click Remove. After saving, you will be asked if you would like to add a room to this location. If you click yes, you will be taken to the Rooms tab. To add a room, click the green Add button at the top of the screen. You will need to enter a name for this room, a description, and whether or not you would like to schedule appointments to this room. Rooms are intended for scheduling. They allow patients to be assigned to a room, or can be scheduled to in place of a specific provider.